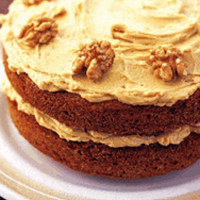 As a rule, coffee and walnut cake is only as good as the buttercream that's lavished over it. So with this in mind, I've opted for a crème au beurre mousseline – it's silky and light and a little more refined than the usual (but perfectly acceptable) icing and filling of flavoured whipped butter with icing sugar. However, if you prefer a more old-school buttercream, or don't have a sugar thermometer to make the coffee mousse icing, use the more familiar recipe, which appears opposite. Preheat the oven to 180°C/gas 4. Grease and line the base of the cake tins with circles of non-stick baking parchment. Place the butter in a food mixer and beat until fluffy and light. Add the sugar and beat again until even lighter. Add a quarter of the beaten egg and beat at full speed, then add the rest gradually, beating well after each addition. (If it curdles, add 2 tbsp from the 225g flour now.) Add the espresso and whisk in. Turn off the mixer, sift in the flour and baking powder and add the chopped walnuts. Fold everything through until no pockets of flour remain. Divide the cake mixture between the two tins, then place on the middle shelf of the oven for 23–28 minutes, or until a skewer inserted in the cakes' centres comes out clean. Allow to cool for 15 minutes, then transfer to a wire rack to prevent the cakes' bases becoming soggy. To make the icing, place 100g sugar and 100ml water in a small saucepan and heat gently until the sugar has dissolved. Turn up the heat and bring to the boil. Using a sugar thermometer, continue to simmer until the mixture reaches 108°C or the 'short thread' stage (when a small amount of slightly cooled syrup stretches between your fingers). Meanwhile, beat the reserved sugar and egg yolks until pale and light. Pour about a quarter of the sugar syrup onto the egg mixture, avoiding the beaters (it's easier to do this if you're using an electric hand whisk; otherwise, just be extra careful). Continue to beat until blended. Repeat this step, adding the same amount of sugar syrup each time and continuing until all the syrup has been added. Beat until it is thick, mousse-like and has cooled (dip your finger in to check it's no longer hot). In a separate bowl, beat the butter until creamy and pale, add the espresso, mix until blended, then gradually add the syrupy egg mixture until it is all well combined. Place one of the cakes upside down on a wire rack and, using a palette knife, spread half the icing over it. Carefully place the other cake the right way up on top of the icing and spread the remaining coffee mousse on the top of that cake. Decorate with the remaining walnut halves and transfer to a plate.